Spend the morning reeling in your favorite fish (put the keepers in the livewells for safekeeping). Relax in the shade while enjoying an on-the-water picnic. And round out the day with a cooling dip off the aft platform. 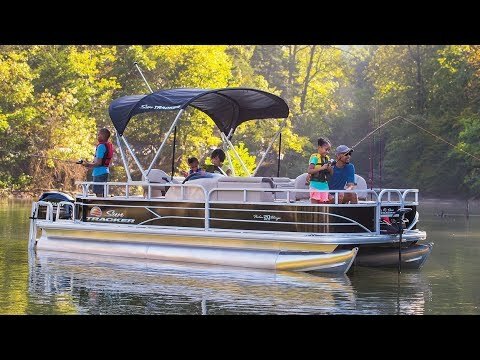 At a spacious 21’ 11” long and 8’ 6” wide, the FISHIN’ BARGE® 20 DLX offers a variety of fishing and comfort features to ensure your every day on the water with family and friends (up to 10 people total!) is as perfect as possible. Fishing for 2-or 10! At 21' 11" long and 8' 6" wide, the FISHIN' BARGE 22 DLX is spacious enough for however many—or few—people who you want to take with you on the water. Regardless the crew size, you'll be impressed with the great features throughout, including the fore and aft fishing decks, two aerated livewells and plentiful rod storage. And don't miss the Stow More seat storage system, which provides easily accessible storage in the couch backs! All that and more makes this a family fishing boat you'll enjoy for years to come. Average dry weight: 1700 lb. Average package weight: 3363 lb. Towing length: 30 ft. 4 in. Storage length: 30 ft. 4 in.